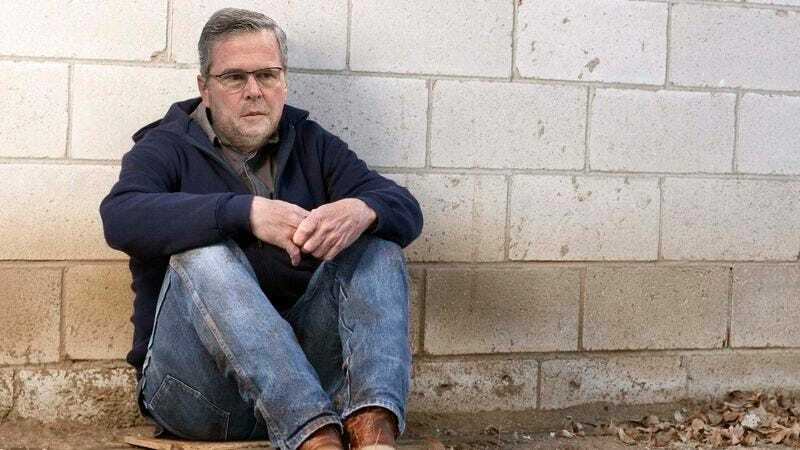 MANCHESTER, NH—Plunging into a downward spiral of despair and self-doubt after a poor showing in the Iowa caucuses, a demoralized Jeb Bush reportedly succumbed this week to New Hampshire’s ongoing heroin epidemic. “Unfortunately, Jeb has suffered a number of significant career setbacks and personal humiliations recently, which left him depressed and highly susceptible to the allure of the cheap and widely available heroin in the rural Northeast,” said political analyst James Peek, adding that the former Florida governor began experimenting with the Schedule I narcotic after a string of weak debate performances and a steady decline in his nationwide poll numbers, and had last been seen injecting 200 mg of black pearl while squatting in a condemned Manchester tenement. “Stress, low self-esteem, and hopelessness are serious risk factors for substance abuse, and like many other people in New Hampshire right now, Jeb’s recent struggles have left him feeling that drugs are his only chance of relief. Hopefully, his campaign can find a way to get him into rehab and back on his feet before Super Tuesday.” At press time, a senior Bush advisor confirmed that the candidate had climbed in the New Hampshire polls after generously sharing a needle with several fellow addicts.